Do you remember the old Merrie Melodies cartoon about the Dover Boys from Pimento University (good old P.U.)? 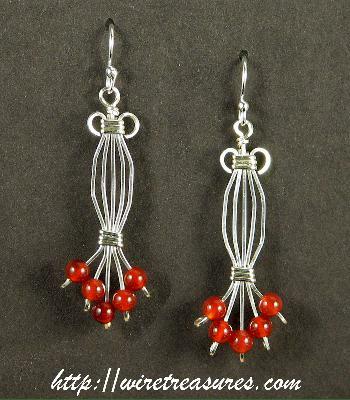 If so, then you will recognize these fancy earrings as the figure of sweet Dora Standpipe, except that I added a "fringe" of five 4mm Carnelian beads to Dora's dress. These earrings are about 1-3/4 inches high and 5/8 inch wide. You are visitor number 1,374 to this page.